FRESNO, Calif. (October 13, 2015) - The 2015 Triple-A National Champion Fresno Grizzlies announced their preliminary schedule for the 2016 regular season. The club will open the 19th season in club history with an eight-game road trip (April 7-14) before returning to Chukchansi Park for their home opener on Friday, April 15th at 7:05 PM against the Las Vegas 51s, which begins a stretch of 16 home games in a 21-day span. 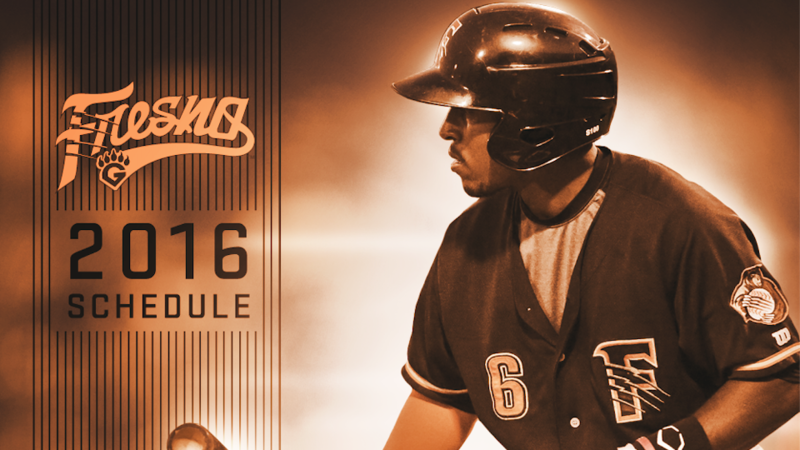 Ticket plans for the 2016 season are on sale now by calling 559.320.TIXS or stopping by Chukchansi Park and meeting a sales representative in the front office. Fans that purchase full season tickets for 2016 prior to October 30th will be entered into a raffle for a custom 2015 Triple-A National Championship Fresno Grizzlies Ring. A highlight of the 2016 regular season includes the return of Oklahoma City, Triple-A affiliate of the Los Angeles Dodgers, to Downtown Fresno. The Dodgers visit Chukchansi Park for a four-game series against the Grizzlies from Monday, May 23rd to Thursday, May 26th. Overall, the 2016 season features 13 home games on Friday, 11 on Thursday, 10 each on Saturday, Sunday and Tuesday, and nine on Monday and Wednesday. Highway 99 rival Sacramento, Triple-A affiliate of the San Francisco Giants, make two trips to Fresno during the 2016 regular season. The first comes on July 4th for a three-game series, with their second and final stop being August 24th through August 28th for a five-game set. That series marks the start of 13 straight games against a division opponent to finish off the regular season slate. Other notable home opponents of the schedule include non-traditional visits by the Triple-A affiliates of the Chicago Cubs, Kansas City Royals and Milwaukee Brewers. Pieces of the 2016 promotional calendar will be announced in November and December, with a full list of promotions coming in February. Stay tuned to the Grizzlies social media platforms on Twitter (@FresnoGrizzlies), Instagram (@instagrizz_fg) and Snapchat (@FresnoGrizzlies) for breaking news. Exchange Policy - Exchange your unused tickets for any home game (excluding July 4th and TTT6), based on availability. The 2015 Triple-A National Champion Fresno Grizzlies, Triple-A affiliate of the Houston Astros, are a member of the 16-team Pacific Coast League and are one of 30 teams in the world playing the highest level of Minor League Baseball. The 2015 season was one of historic proportions for the team and city of Fresno, as the Grizzlies secured their first-ever Pacific Coast League Championship and went on to win the Triple-A National Championship hosted in the city of El Paso. Learn about 2016 ticket plans by calling the front office at 559.320.TIXS between the hours of 9:00 AM and 5:00 PM Monday through Friday. Visit FresnoGrizzlies.com for more information.